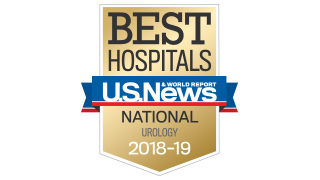 Once again, UT Southwestern Medical Center’s urology program is recognized by U.S. News & World Report for 2018-19 as one of the best hospitals in the country for diagnosis and treatment of urologic diseases. The urology clinic at the UT Southwestern Monty and Tex Moncrief Medical Center at Fort Worth brings UT Southwestern’s clinical urology program – a nationally ranked program – to patients in the Fort Worth area. Our urologists diagnose and treat conditions of the adrenal glands, kidneys, ureters, bladder, prostate, and the male and female genital organs. We’re proud that our research efforts are helping to develop new diagnostic tests and treatments that are used all over the world. It is very important that you do not run out of your medication. Be sure that you have sufficient refills to last until your next appointment with your urologist. We are happy to provide you with a written prescription upon request.